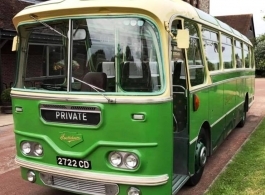 Vintage 1960's Green single deck buses for weddings, proms and events. These buses provide very practical mode of transport, useful for travelling in areas where the larger bus may be restricted due to access issues, low trees ect. Please note the two buses are available from May to September inclusive.